Caring for your rugs will ensure their longevity and aesthetic appeal for longer. The simplest way to do this is to vacuum your indoor rugs at least once a week, twice a week being optimal. Regular vacuuming will keep your rugs in top notch condition, no matter if it's an expensive rug or a relatively cheap rug. Vacuum your rugs just as you would with a regular carpet, unless otherwise stated in the manufacturers care instructions. Sometimes, not all the pet hair is successfully picked up by the vacuum, but then just brush Scotch-Brite's lint roller over the rug for best results (this works great by the way). If you are unsure of what Scotch-Brite's lint roller is, look here. These lint rollers can be purchased at many grocery and convenience stores in South Africa. Rotate your rug at least once a year, this will prevent the rug from wearing out only on one side of it. At Smir Design, we strongly recommend that you use biodegradable and non-toxic cleaning products instead of pulling out the chemical-laden carpet cleaners so widely available. In this way, you are not only doing our planet a favour, but you will ensure that both your human babies and fur babies are safe. The secret to removing stains efficiently on your rugs is time. When you notice a dirty spot or stain, start working on it immediately. The stain will be removed best the sooner you start to spot clean the area as it will not have had time to set into the rug materials. Make sure you regularly vacuum the underside of the rug (if wool) to as you do with the upside. When the rug is stained, move it to an elevated position (so that it's out of the way of toddlers and pets) and spot clean as directed by the manufacturer or as directed below using the make-at-home recipe or Earthsap's Carpet and Upholstery Cleaner (described below). Always test a small area of the rug first with the cleaning product you intend to spot clean with and a white wash cloth to see whether the rug is colourfast or not. Try avoiding store-bought chemicals that contain bleach, as this can damage your rug. Even with the vinegar mixture detailed below, always dilute it first with water if the wool of synthetic fibres are coloured/dyed. The wool rugs in our collection for example you can use the recipe as we describe below as is seeing that the wool is not dyed.For our synthetic range, dilute the vinegar mixtures with a 1/2 cup water first before applying to the affected area. Please take note that if you use lemon juice or vinegar (or in fact ANY type of chemical) on certain materials or tabletops like marble, travertine, limestone and untreated wood/certain treated woods, the acid in the vinegar and lemon juice can damage the surface. If unsure, contact your flooring/ countertop manufacturer first to find out what chemicals/ ingredients you should avoid bringing into contact with it. Combine the above ingredients in a bowl and mix well until the salt dissolves. Pour the mixture into an empty spray bottle and give it a few good shakes so that any undissolved salt crystals can be dissolved a bit more. Spray the mixture onto the affected area until well damp. Take a dry wash cloth and proceed to dab hard onto the spot (if the weave of the rug is very tight, you can even rub, but if in doubt always dab). This is also a great way to discourage your pets from using the rug as their regular bathroom spot as their superior smelling sense will pick up the faint vinegar smell and they don't like it (Don't worry, you won't be able to smell the vinegar). If you do however have a very good sense of smell, simply rinse the wash cloth you used to dab the vinegar mixture dry with until totally clean and dab over the spot to remove excess vinegar odour. Combine the above ingredients in a bowl and mix well until the salt and borax powder dissolves. Pour the mixture into an empty spray bottle and give it a few good shakes so that any undissolved salt and borax crystals can be dissolved a bit more. Spray the mixture onto the affected area until well damp. Take a dry wash cloth and proceed to dab hard onto the spot (if the weave of the rug is very tight, you can even rub, but if in doubt always dab). 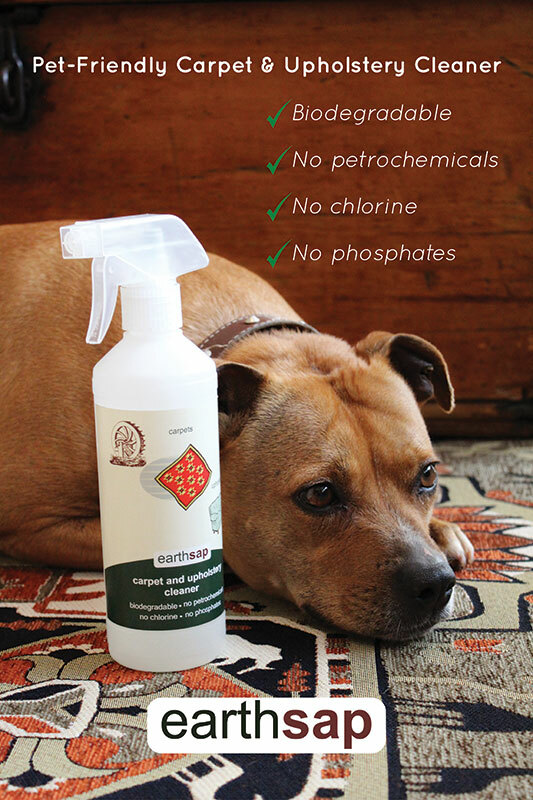 If you don't want to go through the trouble or don't have the time to make the above recipes, you can always buy Earthsap's Carpet and Upholstery Cleaner that comes in a 500ml spray bottle ready to use. Earthsap is a South African product line manufactured using non-toxic, biodegradable, nature- derived cleaners.All their products are based on pure simple ingredients including coconut, palm, citrus and other plant oils. Only pure essential oils are used, no synthetic fragrances which can be made up of over 200 different chemicals, and often cause skin irritation and allergies. Their cleaning products are safe for your family, pets and the environment and are completely biodegradable. You can buy Earthsap's Carpet and Upholstery Cleaner here. Copyright © Smir Design 2019 | Our Terms.